Terry learned to play the banjo when he was 14 and formed his first band in the early sixties with his girlfriend Gay. First they called themselves The Apprentice Folk, and later shortened the name to The Prentice Folk. In 1967 Terry joined the first Irish folk rock band - Sweeney's Men. The name was taken from a character in Flann O'Brien's book "At Swim Two Birds". The other members were Andy Irvine (vocals, mandolin, guitar, harmonica) and Johnny Moynihan (vocals, tin whistle, bouzouki). Moynihan was the first to use the bouzouki in Irish music. In 1968 the trio recorded their eponymous self-titled debut album. After that Irvine left to travel through Eastern Europe. He was replaced by the electric guitarist Henry McCullough, who had toured with Jimi Hendrix. They never recorded anything and their new guitarist left to play with Joe Cocker instead. Sweeney's Men were now a duo, if not two solo artists each trying to make a record of their own. The resultat, "The Tracks Of Sweeney" (1969), was the last LP they made. Both albums were re-released in 1992 on the CD "Time Was Never Here 1968-69". Terry toured Ireland with a group called Orphanage that among others comprised Phil Lynott and Brian Downey, later in Thin Lizzy. Terry and his wife Gay then went to England where they met up with Ashley Hutchings from Fairport Convention. Hutchings wanted to form a band with the three past members of Sweeney's Men and a drummer. Moynihan and Irvine didn't want to be in the same band as Terry again, so they left. Instead the folk duo Tim Hart and Maddy Prior and Terry's wife Gay became members. They called themselves Steeleye Span and their first album "Hark! The Village Wait" was released in 1970. Directly afterwards the group split up due to personal differences. Gay and Terry formed The Woods Band and at the same time Steeleye Span reformed without them! The Woods Band was first a group, but then it was just Terry and Gay using session musicians for albums and tours. They then simply called themselves Gay and Terry Woods. Steeleye Span had a sound engineer called Frank Murray, later manager of The Pogues. Terry and Gay divorced in 1980 and she went on and formed Auto Da Fe. He settled in the Irsih country side with his new wife Marian and their two kids. He hadn't been involved with music for almost five years when Frank Murray contacted him. He wanted Terry to become a member of The Pogues. It wasn't a success at first but in September 1985 Terry became a permanent Pogue. Terry left The Pogues after "Waiting For Herb" and formed a band called The Bucks with Ron Kavana. Ron Kavana had been a support act for The Pogues as early as 1985. One of those gigs were on the 2nd of January 1986 in Claremorris, Ireland. Terry and Ron wrote a song called "Psyco Ceili In Claremorris" about this gig, though they changed the year to 1987. 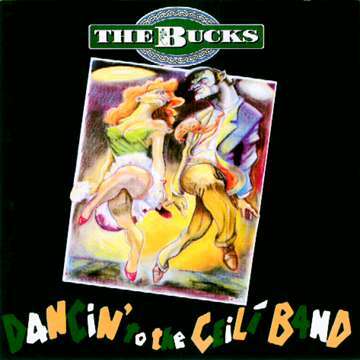 The song was released on the Bucks' debut album "Dancin' To The Ceilí Band" in 1994. Terry and Ron had written songs together for some years and their co-effort "Young Ned Of The Hill" appeared on both The Pogues' "Peace And Love" (1989) and Ron Kavana's "Home Fires" (1991). Terry was a part of Ron's charity project LILT, which featured a variety of Irish musicians. LILT recorded the album "For The Children", where Terry played on most of the tracks. He also appeared on "Home Fires". Ron left The Bucks after their first album, but Terry is still using the name. In 2001 Terry began recording and touring with Dave Brown under the name The Woods Band (Terry used this name previously with Gay Woods in the early 1970s). Terry and Dave have been discussing the possibility of putting this band together for some time. Terry Woods has had a long career in music with various bands since the 1960?s, including 10 years with The Pogues. Dave Brown who formed The Woods Band with Terry has played with the D11 Runners and Little Sister Sage. The music of The Woods Band is an eclectic mix of Irish songs, old and new. The older material includes The Irish Rover (The Pogues), Waxies Dargle (Sweeney?s Men), Thousands Are Sailing (The Pogues), Finnegans Wake (The Dubliners). Other songs include The Spanish Lady, Dicey Riley and South Australia. The newer material will consist of songs written by Terry in a similar vein. The sound of the band is the Sweeney?s Men meet the Dubliners meet The Pogues with a fair dollop of fun thrown in! The instruments used to create this sound are Cittern, Accordian, Mandolin, Guitar, Uillean Pipes, Whistles and a Bass and Drum Rhythm section, giving a very full band sound. When the band was being put together, it was decided to find a new, young singer to front it and by co-incidence Terry had been working as a consultant with a young band called Reel. One of the singers in the band was a tall, dark haired 22 year old called Shane Martin. Shane, who has been singing, writing songs and playing the guitar since his teens then left Reel to join The Woods Band and now with the help of the other 5 band members is determined to make a success of The Woods Band. This disc was not released in the United States. 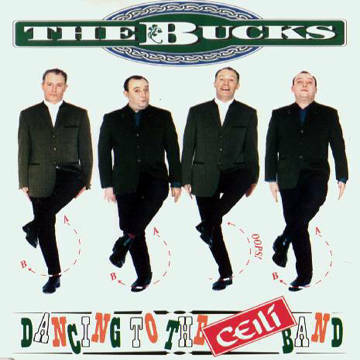 Dancin' to the Ceilí Band/????/??? ?